In the frigid predawn on a Saturday morning in the foyer of the old Wapiti Arena a group of eager midgets sitting on rough-hewn benches lace up skates in preparation for their weekly scrimmage. They draw warmth from the red-hot ravenous homemade wood-burning stove that Rink Manager Johnny Macdonald fired up at 6:30am. Later that night Johnny closed the rink well after midnight following the senior game that saw Johnny’s Red Devils of the South Peace Hockey League (SPHL) defeat the Dawson Creek Canucks. Following a few hours of sleep Johnny would be at the rink again at 6:30 next morning to provide a bit of warmth from the bone chilling cold for members of the figure skating club. Johnny is our link from rink rats and rain barrels to Zambonies, and throughout the Peace Country Johnny Macdonald was known as "Mr. Hockey." * Johnny was 12 when his parents moved from Merritt, B.C. in 1912 to the Lower Beaverlodge district and then to Grande Prairie in 1913 where he was a student in the town's first school. As an adult, retail lumber was his business but hockey was his first love. His roles in the game were many: manager, coach, counselor and mentor to hockey enthusiasts across the age spectrum. Grande Prairie's first covered arena, the Wapiti Rink, was built in 1919. Johnny was Rink Manager until it was replaced in 1946 by the Memorial Arena, a facility he helped to plan and build. It was fittingly dedicated to Grande Prairie youth who had served in two World Wars. For over three decades of coaching, few hockey players, from "half pints" to seniors, escaped Johnny's influence. He is perhaps best remembered as coach of Johnny's Red Devils, Grande Prairie's senior team that became the Athletics in 1955. The Wapiti Arena held 1000 fans – the largest gathering place in town. From that perspective as Manager of a rink that hosted at least weekly hockey games throughout the winter Johnny was responsible for a major source of local entertainment. Hockey was the only game in town throughout the winter. Beyond hockey, Johnny organized ice carnivals, the figure skating club, and figure skating competitions in which he performed. Health permitting, Johnny never missed a hockey game over the years. His contribution to Grande Prairie sports, and hockey in particular, was recognized by the dedication of the Recplex Arena which was known as the Johnny Macdonald Arena: a fitting memorial. A Wall of Fame in his honor is featured at the Coca-Cola Centre. 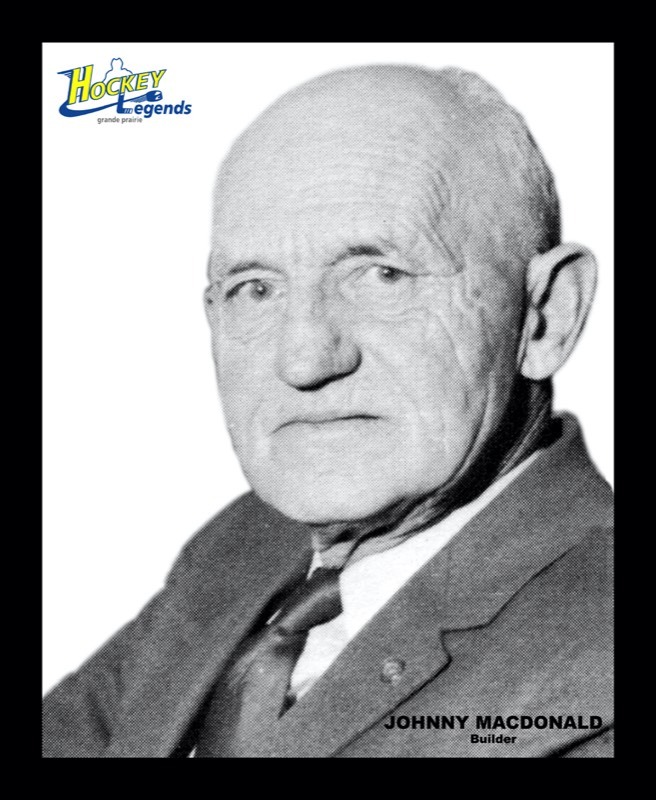 Johnny Macdonald - a Grande Prairie Hockey Legend in 2004. * rain barrels refers to the pre-Zamboni method of flooding the ice using hot water in a 50 gallon oil drum pulled along the ice on a sled. ** An important source of information for this tribute to Johnny is an article by Isabel Campbell (Historian and Archivist – DHT, Tuesday, June, 26, 1984, p.5. ).